Caviteclad is a cavity-based Exterior Insulated Cladding and Finishing System (EIFS) which is used as a versatile, cost effective exterior wall cladding system for residential and light commercial construction. The Caviteclad wall cladding system is made up of 50mm expanded polystyrene sheets that are fixed to timber or steel framing over the surface of a self draining 20mm cavity. The polystyrene sheets are then overcoated and fibreglass mesh reinforced with a range of specially blended proprietary cement based plasters before the walls are finished with a chosen finishing plaster and painted with a 100% acrylic paint system.. 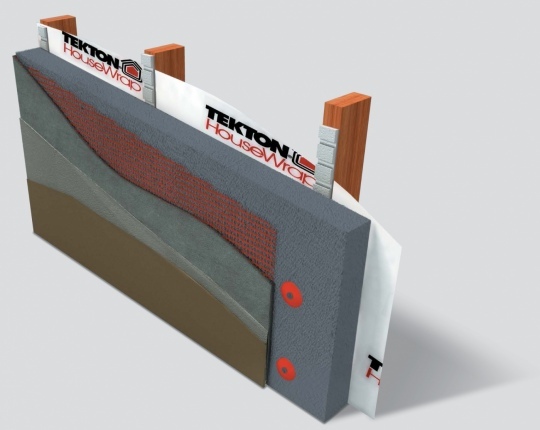 The Caviteclad wall cladding system incorporates a BRANZ (Building Research Association of New Zealand) tested and appraised primary and secondary means of weather defence against water penetration by separating the cladding from the external wall framing with a nominal 20mm drained cavity. This not only ensures the building complies with the latest requirements of the New Zealand building code but ensures it has been formally tested to give long lasting durability even in New Zealand’s most extreme weather conditions.